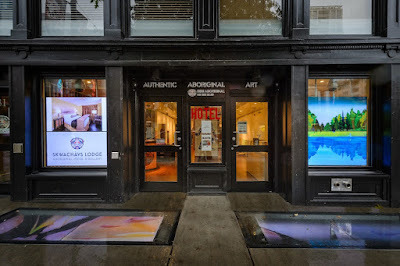 Visiting Info: Hotel: open daily, Reservations; Gallery: Mon-Fri 10am-4pm, Sat-Sun 11am-5pm. Skwachàys Lodge in Vancouver is a jewel of socially responsible travel, culturally inclusive community building, and Native self-reliance. 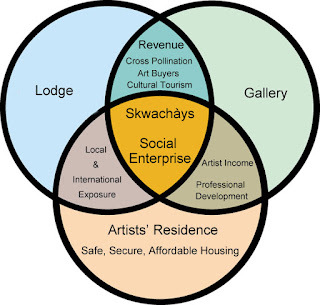 Besides the 18-room boutique hotel and the Urban Aboriginal Fair Trade Gallery in the lobby, Skwachàys Lodge and Residences is also home to affordable apartments for Native artists, workshops and art production space, and a commercial kitchen. 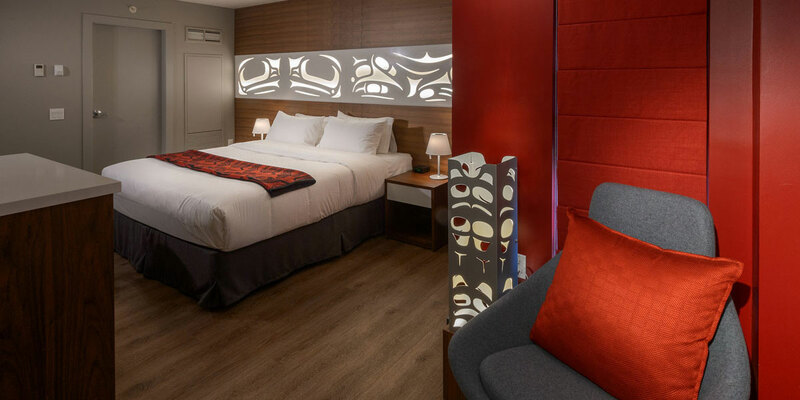 A sweat lodge and smudge room on the roof of the hotel were especially designed as a sanctuary for Native patients who must travel to Vancouver from outlying rural areas for medical treatments. The project was conceived in part beginning in 2002 by the not-for-profit Vancouver Native Housing Society (VNHS), who saw a need for culturally sensitive temporary housing for traveling patients. An online community space for local Native artists started by VNHS was later combined with the housing project, and has grown into a gallery and work space for 24 artists-in-residence. The VNHS was able to mesh its social programs with a provincial and federal government-supported urban renewal project through the renovation of the Victorian-era Pender Hotel. 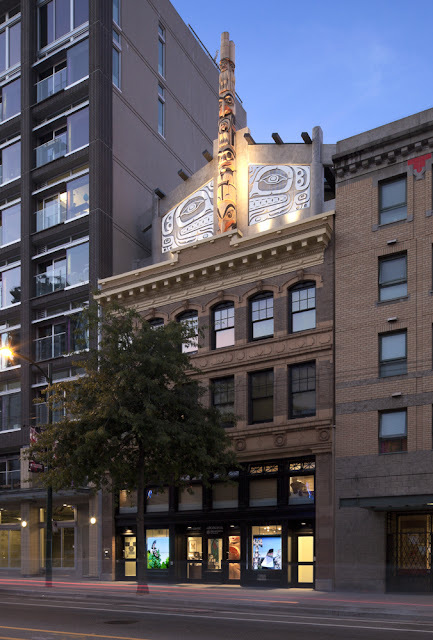 The current façade combines the original, preserved, Victorian architecture with a longhouse and 40-foot story pole by Coast Salish artist Francis Horne Sr. in a unique way that vividly represents the area's history and community. The hotel was renamed Skwachàys (pronounced skwa-chize), the Squamish name for the land at the head of False Creek that is now part of Vancouver. And while these elements unify the layered histories of the place, the video art presentation embedded in the glass sidewalk pushes the project into the future. 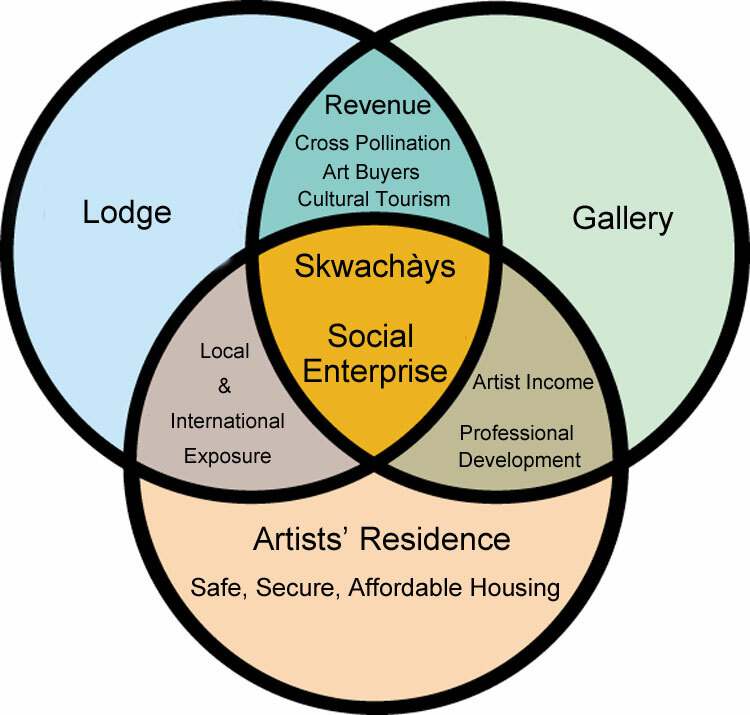 Skwachàys Lodge is growing into a public, multifaceted cultural experience and self-sustaining, Native-owned business enterprise. The VNHS transforms the hotel and gallery profits into housing and artist support programs for the local Native community, thereby avoiding federal government aid programs. The hotel offers two meeting spaces, the Cedars Boardroom and Kayachtn (The Welcome Room). An aboriginally-focused menu provided by Cedar Feast House Catering and local beers and wines are served all day in the Kayachtn Room, where the hotel also holds events such as artist meet-and-greets and storytelling. 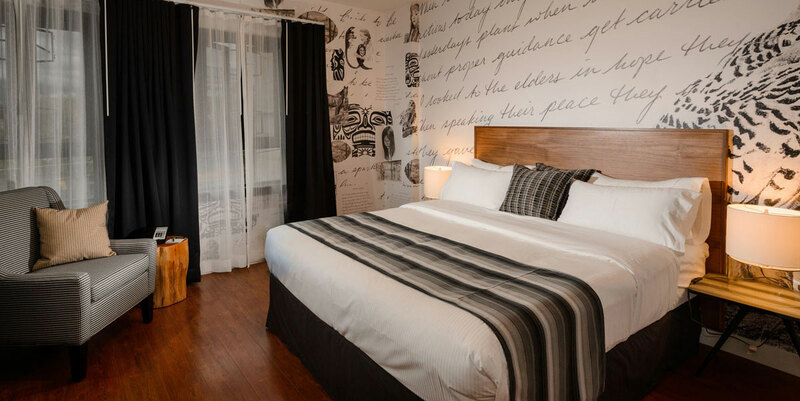 Each of the 18 suites has it's own theme and was created by local Native artists and interior designers. The hotel's webpage provides photos and a detailed description of each room, including the names of the artist and decorators. 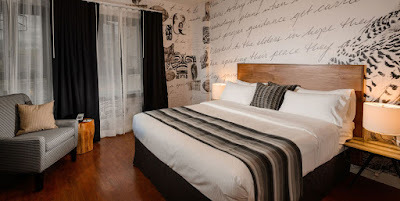 Vancouver Sun article from Oct. 14, 2014, "Skwachàys Lodge: country’s first urban aboriginal hotel opens for business (with video)." NY Post article from Marc 16, 2015, "Checking In: Skwachàys Lodge, Vancouver." Gazette Magazine article from April 14, 2015, "Living with Legends at Vancouver's Skwachàys Lodge."